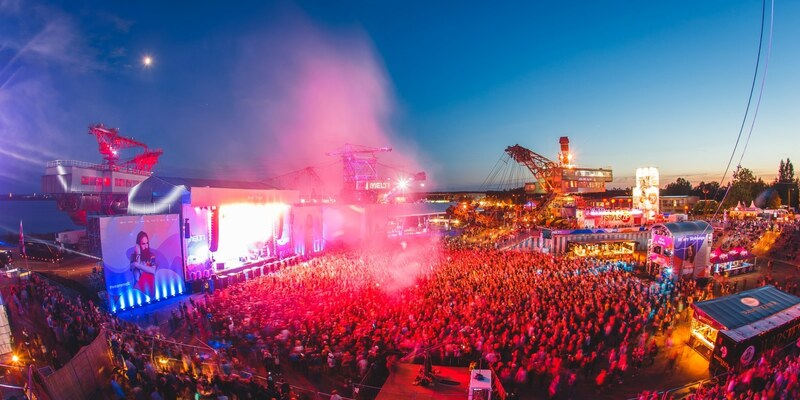 Portishead, Röyksopp & Robyn, Moderat, Fritz Kalkbrenner, Haim, Metronomy and many more artists to perform in front of the industrial backdrop of Ferropolis in Germany from 18 to 20 July 2014. Portishead, Röyksopp & Robyn, Moderat, Fritz Kalkbrenner, Haim, Metronomy and many more artists to perform in front of the industrial backdrop of Ferropolis from 18 to 20 July. Preparations for this year's Melt! Festival, which takes place from 18 - 20 July in Ferropolis, are well underway. But before we will reveal the first 40+ acts, we want to say thank you to all of you who helped us win the 'Best Medium-Sized Festival' award in the Festival Awards Europe. Your votes were very much appreciated. So now for some exciting news for all of you who have been eagerly awaiting our first line-up announcement as we can reveal the first names to play beneath the impressive coal-mining diggers in the 'City of Iron'. We're thrilled to confirm that Portishead will be honouring us with an exclusive performance under the Ferropolis night sky this year. Since the mid-90s, the legendary Bristolian three-piece has been shaping the musical landscape, capturing the zeitgeist with the distinguished sound of debut 'Dummy' and the self-titled sophomore album. In 2008, Portishead returned with 'Third' and an exciting avant-garde approach, once more challenging the boundaries of contemporary music. Once again, Röyksopp and Robyn joined forces and went back into the studio together. Merging the best of both worlds, Röyksopp & Robyn Do It Again 2014 will make its Germany exclusive stopover at Melt! this year. An energetic blast of Scandinavian electro pop is coming our way. Last year, only a few weeks before the release of their second album, Moderat II, Moderat got behind the decks at our Melt!Selektor Stage. After having almost completely sold out their upcoming tour, you'll get another chance to see them live in Ferropolis this summer. We're also delighted to welcome Fritz Kalkbrenner back to the fold, one of the Melt! enthusiasts since day one. Dragging glittery 80s pop into the 21st century, Haim will be travelling all the way from sunny LA to the Melt! peninsula. Arriving from the UK, Metronomy will be presenting their fourth album, Love Letters. The Melt!Selektor Stage as well as resident Ellen Allien and her Bpitch crew will join us once more while the directional house imprint, Innvervisions, will celebrate its first special with label bosses Âme (DJ-Set) and Dixon plus Mano Le Tough, Marcus Worgull, Recondite (live), Kim Ann Foxman (DJ-Set) and more.